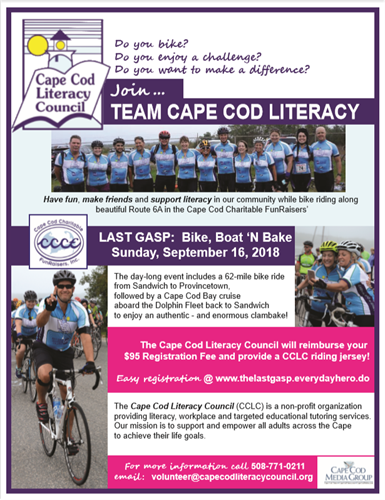 JOIN TEAM CAPE COD LITERACY (CCLC) in the LAST GASP Bike Ride! The CCLC will pay your $95.00 entry fee! Name: JOIN TEAM CAPE COD LITERACY (CCLC) in the LAST GASP Bike Ride! The CCLC will pay your $95.00 entry fee! Have fun, make friends, enjoy a beautiful bike ride, clam bake, lunch, harbor boat ride, and more! Your funds directly assist adults to pass their High School Equivalency exam, learn how to speak read and write English, engage a parent at their child's school, and much more! Ride with us, sponsor a rider, or join us at the after-ride clambake! Contact CCLC to register now. No fee if you ride with Cape Cod Literacy Council - sign up now!